From the air they look like Jurasic golf balls that have struck earth and been semi-embedded into the ground. Those familiar with the Eden Project in Cornwall will know of these biomes that house plant species collected from all over the world. The Eden project in Cornwall is an all-encompassing environmental compound that’s been built on land that was previously an unused clay pit. The centre piece of this complex is it’s two giant domes which replicate a Mediterranean environment and a Tropical environment which is the largest greenhouse in the world. The Tropical Biome covers an area of 1.56 hectares in which tropical plans such as banana trees, coffee, rubber and giant bamboo are kept. The Mediterranean Biome takes up 1.6 acres of space and house plants such as olives and grapes vines. There’s also an uncovered Outdoor Biome which includes plants such as tea, lavender, sunflowers and hops from the temperate regions of the world. The Eden Project is utopia for those keen on gardens and plants and environmentalists. The Project runs environmental education, activities and workshops. It’s a great place for kids as there are all kinds of fun and educational activities to keep them amused. 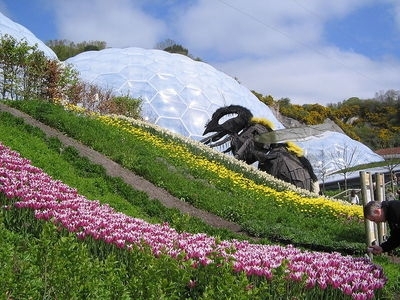 The Eden Project is easily accessible by car, train or bus. (See here for more information >.) If you are staying in the region, you can even walk or cycle there.